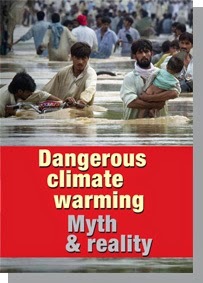 The IPCC’s 2013 assessment did not account for long-term feedbacks. Prof. Will Steffen (2013) notes that: "This budget may, in fact, be rather generous. Accounting for non-CO2 greenhouse gases, including the possible release of methane from melting permafrost and ocean sediments, or increasing the probability of meeting the 2°C target all imply a substantially lower carbon budget". The question is whether these feedbacks are materially relevant for this century's time-scale, and the evidence is in the affirmative. As discussed above, permafrost and methane clathrate stores are already being mobilised, though the scale is not yet large. However a UNEP report (2012) on "Policy implications of warming permafrost" says the recent observations “indicate that large-scale thawing of permafrost may have already started.” And Schaefer, Zhang et al. (2011) found that: "The thaw and release of carbon currently frozen in permafrost will increase atmospheric CO2 concentrations and amplify surface warming to initiate a positive permafrost carbon feedback (PCF) on climate…. [Our] estimate may be low because it does not account for amplified surface warming due to the PCF itself…. We predict that the PCF will change the Arctic from a carbon sink to a source after the mid-2020s and is strong enough to cancel 42-88% of the total global land sink. The thaw and decay of permafrost carbon is irreversible and accounting for the PCF will require larger reductions in fossil fuel emissions to reach a target atmospheric CO2 concentration" (emphasis added). Paleoclimatology (study of past climates) suggests that if longer-term feedbacks are taken into account, then the Earth's sensitivity to a doubling of CO2 could itself be up to double that of the "fast" climate sensitivity used by most climate models, in the range 4.5–6°C (The Geological Society, 2013). These "slow" feedbacks amplify the initial warming burst. A measure of these effects for a doubling of CO2 is known as Earth System Sensitivity (ESS). Longer-term ESS is generally considered to come into play over periods from centuries to several millennia, depending on how fast is the rate of change in greenhouse gas levels and temperature. The problem is that the rate of climate change now being driven by human actions may be as fast as any extended warming period over the past 65 million years, and it is projected to accelerate in the coming decades. This means that longer-term "slow" events associated with ESS – such as loss of large ice sheets, and changes in Arctic and biosphere carbon stores – are starting to occur now, are happening much more quickly than expected, and likely will proceed at a significant scale in the current century. 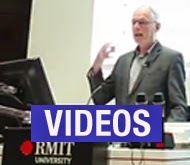 We face an event unprecedented in the last 65 million years of "fast" short-term and "slow" long-term climate sensitivity events occurring alongside one another in parallel, rather than one after the other in series as is usually the case. Thus, even as some of the "fast" warming is still to occur, some of the "slow" feedbacks are already coming into play, as is now evident (Previdi, Liepert et al., 2011; Hansen, 2013). Advocates for climate change action often emphasise the positive economic consequences, such as a boom in “green” jobs, the clean energy industrial revolution, or the great investment opportunities. But there is another economic component to the discourse. It is the view that actions should not be undertaken that would be economically disruptive, and therefore the range of actions to be considered should only be those which do not challenge overall economic growth. 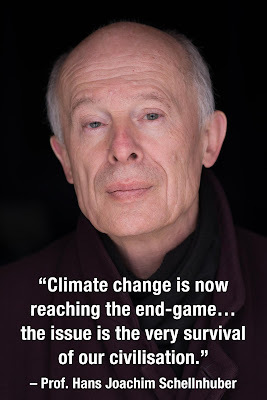 Stern (2006) said keeping the rise to 2°C was "already nearly out of reach" because it meant emissions "peaking in the next five years or so and dropping fast", which he judged to be neither politically likely nor economically desirable. He said that annual emission reductions of more than one per cent a year “have historically been associated only with economic recession or upheaval”, and that it would be “very difficult and costly to aim to stabilise at 450ppm CO2e” (viewed as a 2°C target). So he nodded towards a higher target where “the annual costs of achieving stabilisation between 500 and 550ppm CO2e are around 1% of global GDP” because “stabilisation of greenhouse gas concentration in the atmosphere is feasible and consistent with continued growth”. Reductions in emissions greater than 3-4 per cent per annum are incompatible with a growing economy (or so we’re repeatedly advised). From Stern and the UK’s Committee on Climate Change through to virtually every 2°C emission scenario developed by ‘Integrated Assessment Modellers’, reductions in absolute emissions greater than three to four per cent year on year are judged incompatible with a growing economy… we have found no examples of economists suggesting that prolonged emission-reductions above three to four per cent per annum are economically sustainable (Anderson, 2013). 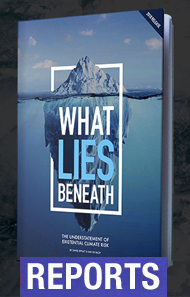 …academics may again have contributed to a misguided belief that commitments to avoid warming of 2°C can still be realized with incremental adjustments to economic incentives. A carbon tax here, a little emissions trading there and the odd voluntary agreement thrown in for good measure will not be sufficient… as the remaining cumulative budget is consumed, so any contextual interpretation of the science demonstrates that the threshold of 2°C is no longer viable, at least within orthodox political and economic constraints… Acknowledging the immediacy and rate of emission reductions necessary to meet international commitments on 2 °C illustrates the scale of the discontinuity between the science (physical and social) underpinning climate change and the economic hegemony. Put bluntly, climate change commitments are incompatible with short- to medium-term economic growth (in other words, for 10 to 20 years). Moreover, work on adapting to climate change suggests that economic growth cannot be reconciled with the breadth and rate of impacts as the temperature rises towards 4°C and beyond 6°C — a serious possibility if global apathy over stringent mitigation persists. Away from the microphone and despite claims of 'green growth', few if any scientists working on climate change would disagree with the broad thrust of this candid conclusion. The elephant in the room sits undisturbed while collective acquiescence and cognitive dissonance trample all who dare to ask difficult questions. For many countries, the core assumption about how to address climate change is that you negotiate a treaty with binding emission targets stringent enough to meet a stipulated global goal — namely, holding the increase in global average temperature to less than 2°C above pre-industrial levels — and that treaty in turn drives national action. This is a kind of unified field theory of solving climate change: get the treaty right; the treaty dictates national action; and the problem gets solved. This is entirely logical. It makes perfect sense on paper. The trouble is it ignores the classic lesson that politics — including international politics — is the art of the possible (Rigg, 2012). And the bottom line is that the “art of the possible” means one thing above all other: no economic disruption. Figure 4: Emissions reduction paths for 2°C target (66% probablity). Examples of per-capita emissions paths of CO2 for three groups of countries according to the WBGU budget approach without emissions trading. Although they allow compliance with national budgets, they would only be partly practicable in reality. The countries are grouped according to their annual CO2 emissions per capita from fossil sources, whereby the CO2 emissions are estimates for 2008 and the population figures are estimates for 2010. Red: Country group 1 (greater than 5.4 t CO2 per capita per year), mainly industrialised countries, (e.g. EU, USA, Japan) but also oil-exporting countries (e.g. Saudi-Arabia, Kuwait, Venezuela) and some newly industrializing countries (e.g. South Africa, Malaysia). Orange: Country group 2 (2.7–5.4 t CO2 per capita per year), which includes many newly industrializing countries (e.g. China, Mexico, Thailand). 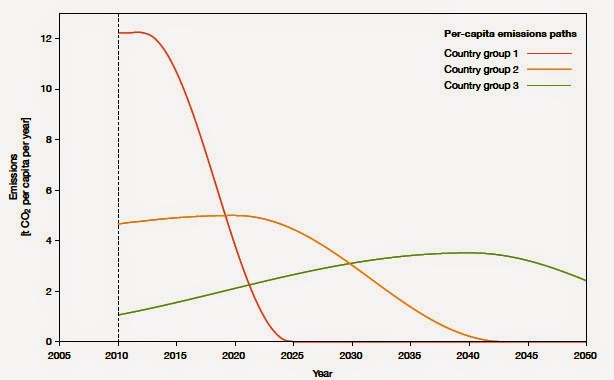 Green: Country group 3 (less than 2.7 t CO2 per capita per year), mainly developing countries (e.g. Burkina Faso, Vietnam) but also large newly industrializing countries (e.g. India, Brazil). Source: WBGU, 2009. In essence a 2°C energy agenda requires rapid and deep reductions in energy demand, beginning immediately and continuing for at least two decades. This lengthens the window of opportunity in which to transition to a low carbon energy supply system (almost zero-carbon for 2°C). Nevertheless, and counter to most low-carbon scenarios, if poorer nations are to be ‘given’ a longer period for de-carbonisation, a genuinely 2°C energy supply system for the majority of Annex 1 nations would need to be virtually zero-carbon by around 2030; in effect a Marshall plan for energy supply. A suite of iterative mechanisms to counter, or at least alleviate, issues of rebound, this may include price mechanisms, progressive metering tariffs, etc. Appoint a senior minister with the principal responsibility for maintaining an equitable transition to a low-carbon society.